QSpot Center, based in Ocean Grove, has filed a discrimination lawsuit against the Jersey Shore Arts Center in an effort to stop the scheduled eviction by the end of this year. “I have been shocked and I think everyone in the community was shocked over this,” QSpot Executive Director John Mikytuck said earlier this week. The Jersey Shore Arts Center, located at the entrance of Ocean Grove, informed QSpot several months ago that their lease would not be renewed at the end of the year, citing the agency’s lack of “arts and education” programming. QSpot, a gay-based center tenant since 2012, argues that it does have a large arts and education component and is the creator and producer of QFest, New Jersey’s only LGBT film festival and recipient of a 2016 Monmouth Arts Council Grant. Additional QSpot arts programming includes live performances by artists such as Emmy-winning actor Leslie Jordan, America’s Got Talent contestant Julia Scotti, and film/television director Del Shores. JSAC Executive Director Herb Herbst said previously that the decision is based on QSpots lack of arts and education goals. He said QSpot is not being specifically targeted. Herbst declined to comment on the lawsuit and referred any questions to the center’s attorney Richard Weber, of Neptune. Weber said that the allegations that the lease is not being renewed based on the QSpot’s purpose is not valid. “The center knew this was a gay-based organization when is signed the lease to begin with so why, all of a sudden, are we prejudiced?” he asked. Weber said that all leases at the center are on a year-to-year basis and that the center even evicted a church under the same premises. “These leases are never permanent. They are all on a year-to-year basis – we do not give multi-year leases,” he said. Weber said there is a reverted clause on the center’s charter stating that the center can only be used for education and the arts. “A dance studio obviously meets that requirement but a social organization like this does not. This is why we even had a church leave; it is not part of what is allowed,” he said. He said no court date has been set on the lawsuit. However, QSpot is asking the court grant a preliminary injunction to prevent the eviction pending further proceedings on its discrimination claim. The suit also seeks compensatory and punitive damages, and attorneys’ fees and costs of litigation. On Nov. 21, QSpot filed a discrimination lawsuit against the JSAC in Superior Court of New Jersey. The suit alleges that Herbst acted out of bias towards the lesbian, gay, bisexual and transgender (LGBT) community when he chose not to renew QSpot’s lease. “Herbst’s actions are a violation of New Jersey’s Law Against Discrimination (LAD), which protects tenants against discrimination based on sexual orientation and gender identity,” a recent QSpot press release said. “Over the past six months, QSpot has taken every reasonable step to encourage the Jersey Shore Arts Center to reconsider its decision not to renew our lease. At each point along the way, Herbst and JSAC’s leadership have absolutely refused to seriously discuss it. 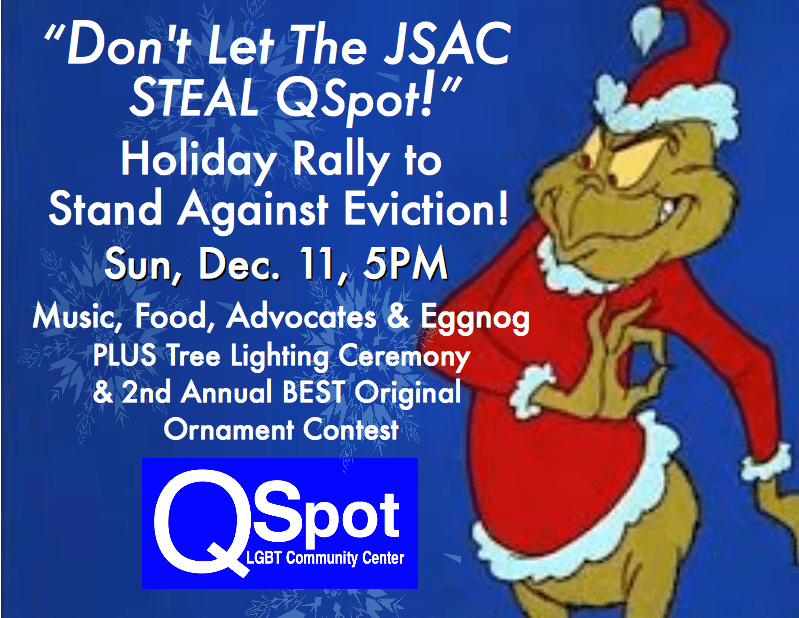 With no other options and little more than a month before eviction, QSpot has been forced to file a lawsuit to protect our home and defend our right to be in it,” Mikytuck said in the statement. QSpot is represented by Michael Long and Steven Rosato, based in Roseland, with support from the Lowenstein Center for the Public Interest. It has also asked that the court hear the matter on an expedited basis.